We cover : Cambridge, Peterborough, Huntingdon, Newmarket, Royston, Bedford, St Neots, St Ives, Ely, March, Wisbech, Yaxley, Papworth and surrounding areas. Standard nozzles have 4 or 6 pencil jets at the rear to propel the hose forward up to 100 meters along the drain if necessary, the nozzle enters the blockage and the jets of water break up the offending obstruction. We also have nozzles with both pencil jets to the rear and one facing forward to break up any particularly difficult obstruction. 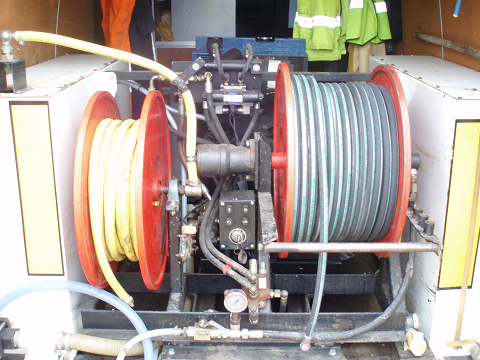 However drain jetting is not just about clearing blockages; high pressure water jetting machines are also used to maintain and clean a system or to prepare a section of pipe for a drain repair. Drains are also cleaned in this way prior to being camera surveyed particularly on new build projects if that system is to be adopted by a local authority. Blocksaway Ltd. also use high pressure water jetting equipment to clean and disinfect the interior of tanks and manholes, as well as concrete patios and driveways by attaching a water pressure gun and lance instead of the nozzles used for drain cleaning.